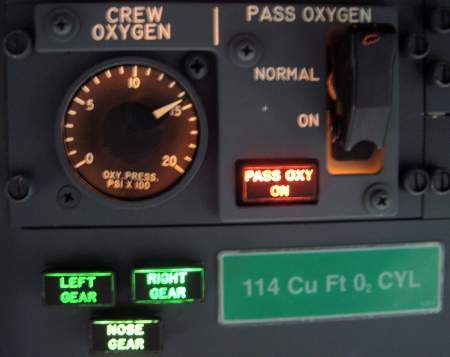 When conducting the oxygen mask flow & intercom check, monitor the crew oxygen pressure gauge to ensure a steady flow as any fluctuations may be due to an obstruction in the system. Give a long check of the flow on the first flight of the day in case the crew oxygen shut off valve has been closed. A short check may sound OK but you may be hearing the residual oxygen left in the lines rather than fresh oxygen from the bottle. 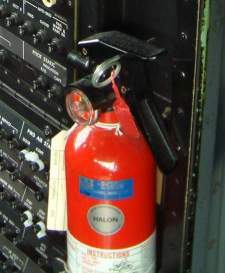 The F/O should ensure that the crew oxygen shutoff valve, located at the bottom outside of the P6 panel, is open (anticlockwise) and ideally backed off by half a turn to avoid damage to the seal. 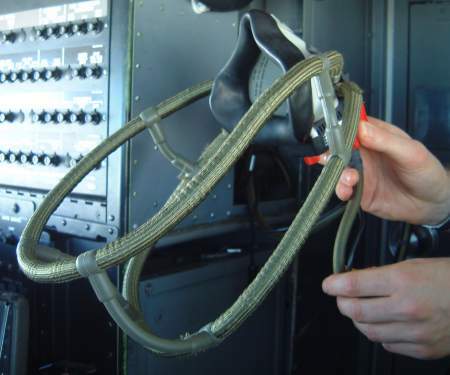 This should be done during the cockpit preparation, particularly in airlines where it is the practice to close this valve overnight. 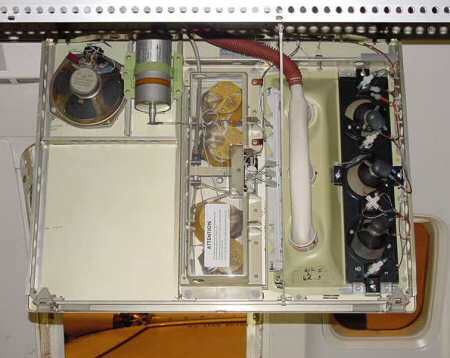 Crew oxygen pressure on aft overhead panel should be checked against MEL 35-1 or FPPM 2.2.14. The minimum despatch quantity varies with size of bottle, bottle temp and number of flightdeck crew. 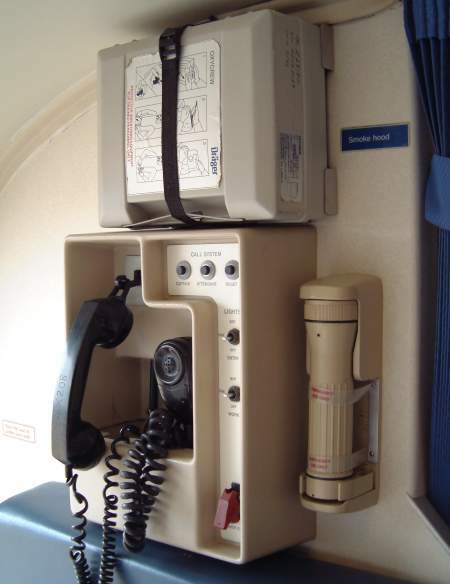 The minimum amount of oxygen is based upon one hour of normal flight at a cabin altitude of 8000ft for one pilot with the diluter set to NORMAL (76 cu ft bottle). Crew oxygen is stored in a bottle in the forward hold. 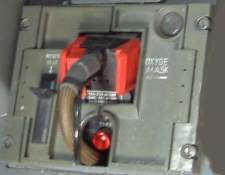 On older aircraft (pre 1990 ish) there is a servicing point on the outside (see photo below) however on most access is gained through the forward hold. 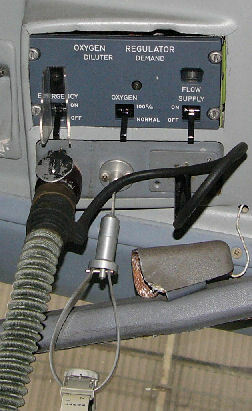 All aircraft have a green discharge disc on the outside to warn crews if the bottle has discharged from overpressure. This should be checked on every walkaround. Normal: Red latch on left is up - Gives air/oxygen mix on demand. Use if no fumes are present eg decompression. 100%: Push red latch on left down - Gives 100& oxygen on demand. Use if smoke or fumes are present. Emergency: Rotate red knob clockwise - Gives 100% oxygen under pressure. Used to clear mask & goggles of fumes and should also be used if aircraft is depressurised above 39,000ft. Classics & NG's: Will deploy automatically above 14,000ft cabin alt or when switched on from the aft overhead panel. No oxygen will flow in a PSU until a mask in that PSU has been pulled. Passenger oxygen should not be used as smoke hoods as the air inhaled is a mixture of oxygen and cabin air and there is a significant fire hazard with oxygen in the cabin. 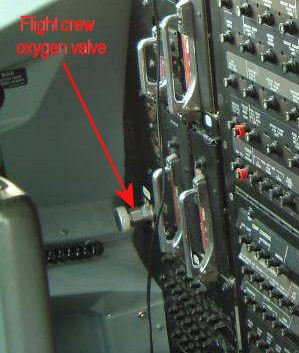 Passenger oxygen on 737-1/200's is supplied by two oxygen bottles in the forward hold. 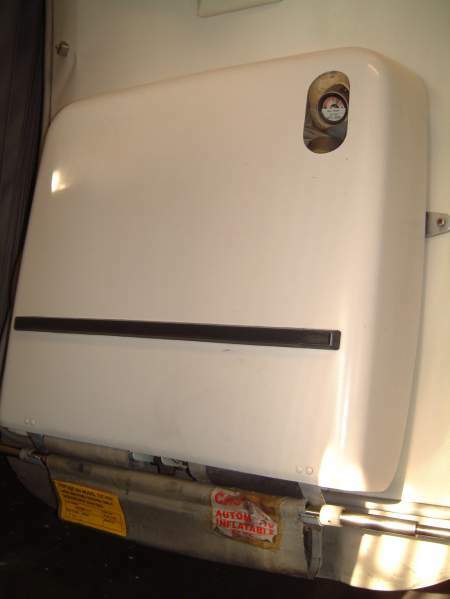 The capacity varies with operator but is typically 76.5 cu ft each. 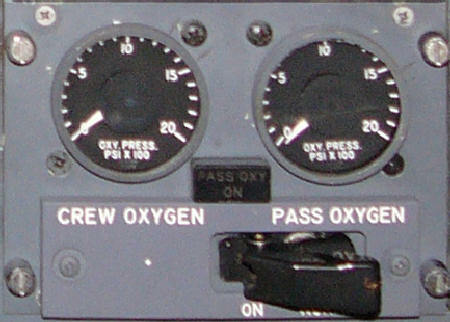 Oxygen bottle pressure is indicated on the aft overhead panel. When armed, will illuminate if power is lost to DC bus 1. 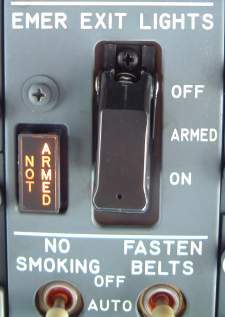 They can also be switched on from the aft flight attendant panel. Whenever these lights are on, they are being powered from their own individual Ni-Cad batteries and will only last for 10mins. After pulling the toggle, the oxygen generator will operate for less than 30 secs. Don’t worry! The oxygen remains in a closed loop system within the mask and filter to prevent contamination from the outside air. It is filtered twice, on inhalation and again on exhalation, and is breathable for approximately 20mins. Do not inflate until you are outside the aircraft as it will impede your exit and you could puncture it as you leave. Is BCF and works by removing oxygen from the fire triangle of oxygen - heat - fuel. As it does not directly cool the fire, when oxygen returns, so could the fire. To operate, remove ring and press down on top lever. Hold upright and beware, BCF fumes are toxic. Serviceability check includes the pressure gauge. Tip: Be extremely careful to remember to disarm any door slides you may have armed on flights without cabin crew eg ferry flights or air-tests.